For more than a hundred years, Washington State University wheat breeders have worked side-by-side with Washington’s dryland farmers to develop new wheat varieties that thrive in the state’s driest regions. Here growing in the drylands of Washington, WSU’s Otto winter wheat won a 2017 state yield title and placed fifth nationally. That century-long partnership is paying off. WSU-bred winter wheat claimed the state yield title and placed fifth in the nation in the National Wheat Foundation’s 2017 dryland winter wheat yield contest. Franklin County farmer Brian Cochrane grew 92 bushels per acre on a five-acre plot near Kahlotus, Wash., benefitting from record autumn rainfall to blow past the county average of 32 bushels an acre. “I did it by planting Otto,” Cochrane said. A WSU variety, Otto was one of only two public-bred wheats to place in the top five nationally. “It’s a team effort with WSU,” said Cochrane. 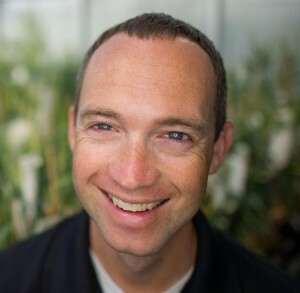 With WSU’s Connell field trials only four miles away, he can call WSU researchers to ask questions about disease, falling number issues, economics or varieties to plant. 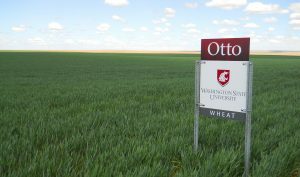 A soft white wheat released in 2011, Otto is named for Otto Amen, a former state representative, WSU alumnus and wheat producer who established an endowment to fund dryland wheat research in Washington. See all the national winners at the National Wheat Foundation website.